I have never understood cottage cheese hate—I suspect it’s related to mayonnaise hate — and I won’t apologise for being a diehard fan. It’s crazy versatile. 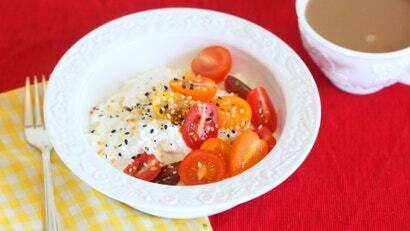 My new favourite breakfast follows a simple template of cottage cheese + fruit or veg + seasoning. It’s adaptable to every whim and mood, even my most dire moods, which are always in the morning. Right now I’m on a cherry tomato + bagel seasoning kick, but I’ve been known to get nutritional yeast involved. As you can see, the spoonable dairy can be forever riffed on, and plays extremely well with both the sweet and savoury. My only caution: Do not get the low- or no-fat kind, as those can taste mealy, dry, and are nowhere near as satisfying. After all, the goal is to start your day on a note of satisfaction. Not if (like two thirds of the world's population) you're lactose intolerant.